My group and I jumped back into the fantasy genre this week, and did with a new game, no less; Green Ronin’s tabletop version of Bioware’s video game, Dragon Age. Now I can’t write this post without doing a little bit of explaining as to why we didn’t pick up and jump back into our 4e game. It seems that my group (and I’ll leave myself out of the equation) has a bit of 4e burnout. The general consensus that I picked up from the guys is that Essentials has left a bad taste in their mouth, there’s a glut of books, and the character builder going web only stinks. So while this post isn’t really meant to talk about my group’s issues with 4e, I thought it was worth mentioning as this is mostly a 4e D&D blog. So on to Dragon Age, from Green Ronin. 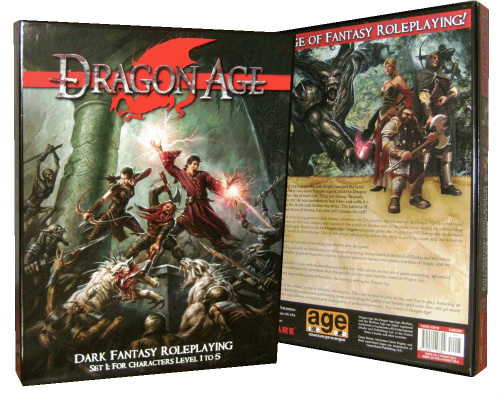 Dragon Age is meant to be an introductory RPG, and the first release covers only levels 1-5, of what are eventually going to be 20 levels of play. It comes in a boxed set which includes the player’s guide, a Dm’s guide, a poster map, and dice. Sound familiar? Yep, it’s a very similar product to the old school D&D boxed sets of the 80’s, and if you ask me if this was intentional, my answer would be a resounding “yes!”. So how does the game play? Very easily actually. In fact, this is the type of game you can pick up, read the book in the afternoon, and run the game at night without worrying too much about whether or not you are getting it right. Here’s the deal, the majority of actions in the game, whether they are ability tests (skill checks), or attack rolls, are made rolling a 3d6+modifier vs. a target number. That’s it. That’s the core mechanic of the game in a nutshell. And combat? Well, it’s the same thing. You roll a 3d6+modifiers vs. the target’s defense, and if you hit, you roll your weapon’s damage die and subtract your target’s armor for the total number of hitpoints lost. Very, very simple, and very fast. Combat in Dragon Age also has what it calls “stunts”. Stunts work the following way: when you roll your attack, if you roll doubles you gain stunt points. The stunt points you get are based on the number you rolled on one of your dice, which should be a different color and the game calls it the “dragon die”. If you roll doubles on the attack, and the dragon die showed a 4, then you get 4 stunt points to spend that round. You look at the chart, and buy stunts. You must use the stunt points that round, or you lose them. Stunts range from extra damage on the attack, to disarming, or knocking your opponent prone. It adds a neat twist to the old school “hit it with my sword” combats, and makes the fights more cinematic and lets you as a DM be more descriptive. And if you are a spell caster? Well, don’t worry, spells have stunts too! So while in D&D everyone is hoping for the 20 for the critical hit, Dragon Age has people waiting around for the doubles, and on our game they came up often enough. So is combat as tactical as 4e? Well, no, but it can be. The game does not really assume you are playing on a grid, but I did and see no reason why not too. There are minor rules for cover and that sort of stuff, so the tactical player can get his fix, but there are no things like attacks of opportunity to make movement seem like a tactical chess game. My opinion is that Dragon Age vs. 4e at 1st level had the combat moving faster in Dragon Age. I may be wrong, but that’s how it felt to me. One thing I enjoyed about the adventure I ran is that combat wasn’t the main focus, a welcome feature when compared to the published 4e stuff I’ve ran in the past. I was using an adventured titled “A Bann too Many” from the Dragon Age GM’s Screen, and it featured a healthy mix of exploration, roleplaying and combat encounters. In fact, this adventure really gave players the chance to shine using things like intimidation, tracking, communication, and other abilities outside of combat. Now truth be told, my group wasn’t in the most roleplay-intensive of moods that night, as it was a mini-reunion of sorts for us and we hadn’t all gamed together in a while. The tone around the table wasn’t as serious as I would have liked it to be, but I had a blast. I didn’t really have too many moments of looking things up in a book (if any, correct me if I’m wrong players) and I believe that’s part of the strength of the single 3d6 mechanic that makes up 99% of the rolls in the game. That and very little rules getting in the way of combat make this an easy to pick up game, as I said in the beginning of the article. So what’s next for us? Well, that’s a good question. I like 4e, I enjoy running 4e and I started DM’ing with 4e. I’d like to keep playing 4e, although I must say that Dragon Age was a huge breath of fresh air. My players seems to be on a 4e funk, and I may have to follow them down that path if I want to keep playing here at home. Honestly, I don’t mind. I’ve learned so much these past 2 1/2 years that I feel comfortable enough learning and running any system you put in front of me by now. And they seemed to like Dragon Age, a lot actually. So it may be that this becomes our game of choice for a bit. We’ll see. Do I recommend it? Absolutely, more so if you are looking for a very simple game to pick up and learn. Trust me when I tell you, this fits the bill. Now why don’t you go read my friend Daniel’s account of our game, over at his blog? He seemed to enjoy himself with it too. I think the only two times we pulled out the book (aside than to look for the list of Stunts) was when going over the Magic rules for the first (and only time – he only cast one spell, right?) and to verify the Two-Weapons Style rules (which I’m still not sure of). I’d totally keep playing this game. Especially after seeing a glimpse of what’s coming in Set 2 and how it addresses the few things we all were like, I wish there was this or that in this game. I love Dragon Age. It is such a simplistic yet solid game! I really enjoyed an interview on the Escapist from the designer about it.. I like the term “Neo Retro.” Very cool. Dragon Age has me excited about RPGing in a way that I haven’t been in a while. I can’t wait to run my first session of it in the near future. I agree. Let’s keep playing. I haven’t felt invested in a character in a while. It’s got a new twist with an old school feel. Loved the fact that battles aren’t bogged down with statuses and attack of opportunities. And the stunt tables are sweet. I’m glad to hear you’re back at gaming and think a change of games is good for any new GM’s development. It also would be nice to see Dragon Age get more blog love since it’s a good game with a ton of potential. As long as everyone is having fun, you’re playing the right game. As for D&D, my groups’ experiences aren’t much different than yours: 4E is dead and buried as far as we’re concerned – all but 1 player grew tired of the one-dimensional nature of characters and the game in general. The stealth edition change and the CB going online were what pushed everyone over the edge and so in the last month we converted both campaigns over to a FATE-based version and everyone loves the change, including our one lone 4E hold-out. FATE is also an amazing system. FATE, Dragon Age, and Savage Worlds are all the “little Engines that could.” They perform wonderfully and have quite amount of flexibility and a strong backbone, despite not being massively rules heavy. Thanks for the review. Encouraged me to pick up the used copy my local game store had when I was there earlier today. Really like that they made the Box for the box set big enough to fit the DM screen and module. Kinda see how the 4e burnout goes too. I think a couple groups I’m in are maybe getting to that point. Not having sessions for a while due to player illness in one group and no time in the other hasn’t helped much either.Probably going to give this and the cheap copy of the Warhammer RPG I picked up a while back a try with friends soon and see how they go. However Dragon Age IS a breath of fresh air with it’s ultra simple mechanics compared to 4e and Pathfinder. But yes, a very good review. I may give this game a second look afterall. I’m in a similar boat: DM who loves 4e, group in 4e burnout. We’re about to take the “new” World of Darkness for a spin as a break from dnd. Dragon Age is on my list to try as well, especially now that I’ve read this review. I have played a few sessions of Dragon Age and must say that it is a very reponsive and fast system. We had an absolute blast. A great game and system and well worth adding to anyone’s collection of rpgs. With that said, while WotC is often criticized for too many new books released, I would say the opposite has been true with Green Ronin’s Dragon Age. If my group had played Dragon Age as regularly as we play other game systems we would have maxed out our characters at level 5 with the current box set, and have been sitting around waiting for the next release (still not available as far as I have been able to find). So a little more game support would be nice in this case. As to 4e “burnout” I think that happens with most rpg’s in this day and age. Back in the late 70’s to early 80’s there were only 2 to 3 rpgs available for my gaming groups to choose between and they were all different genres. 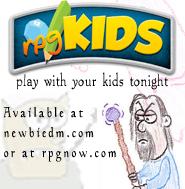 So if we wanted fantasy AD&D was about it. When MERP became available at our local game store, we took a break from AD&D ( we had what would now be called “burnout”) and were ready for something fresh. Now so many options are available that I think we see “burn out” with most systems is a prolonged campaign is planned. Our group experienced the same thing with both 4e, and Warhammer FRPG. We play a new system for a 1 or 2 shot session then return to our campaigns. It keeps things fresh, but maintains an ongoing story line for us all. I also wanted to give you this handy dandy lil tool- The Dragon Age Codex.